Yeah. I'm totally a "vegan". I don't eat any animal products except cheese, steak, cream cheese, shrimp, chicken.... Thanks Chris. Reminds me of when I heard about the vegan cupcake eating contest near the town where I used to live. 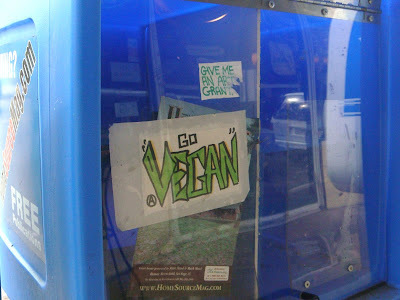 I never thought gluttony was one of the tenants of veganism, but how silly of me not to realize it was a "vegan" contest. Bet they had eggs and milk in those cupcakes, too.